Figuring out what marketing technologies your team needs is essential–and challenging. What’s even harder? Figuring out how to combine different technologies into a MarTech stack that works. In this eBook, you’ll learn all about the rapidly-expanding marketing technology landscape and how it all comes together in a comprehensive MarTech stack that works. 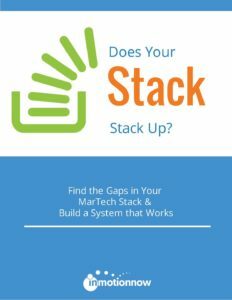 Make sense of Martech stacks and learn how to make them work for your team.